The crossbow will be an interesting new weapon, and the parkour mechanics seem to have undergone some changes to give them a new French flair. Beyond those and a bit of history lesson, we really didn't get anything new out of this video. The fighting looks as fluid and satisfying as ever, but without a chance to see Arno move in real time, it's hard to tell if the team has really updated the combat. 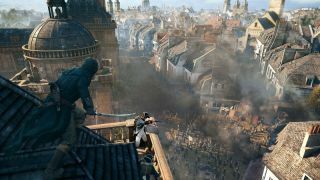 In addition to the gameplay, Ubisoft has said that although the game will put the player in big moments during the revolution, it “did not want to be trapped by doing a checklist of historical events.” The developer has already stated that it's trying to open up the player's freedom and choice. Ubisoft has also released a short video setting context for the revolution and giving a brief history of Bastille Day which you can catch below. Assassin's Creed Unity is set to release on October 28th.